South Africa - McCormack sends a brief account of his recent visit to South Africa. 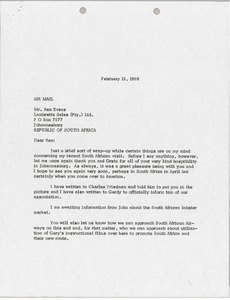 He notes that he is still awaiting information on the South African lobster market. 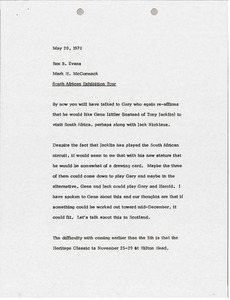 Suggests reaching out to South African Airways about utilizing Gary Player's instructional films to promote South Africa and their new route. McCormack notes that there is a possibility that they will be representing Jackie Stewart, the race driver. 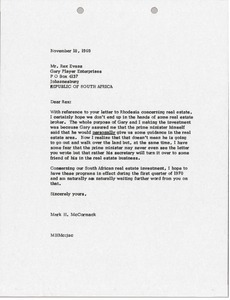 South Africa - Concerning Gary Player South African and Rhodesian real estate deals. 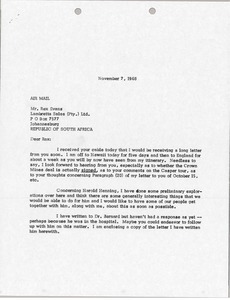 McCormack explains that he does not want the Rhodesia deal to end up with a real estate broker. 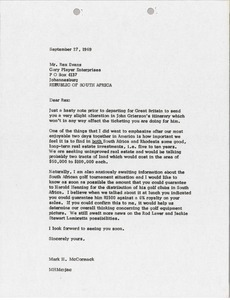 Concerning the South African deal, McCormack indicates that he hopes the programs will be effective starting quarter one of 1970.